Giant portraits of the world's most tense borders went on display Tuesday on the longest remaining stretch of the Berlin Wall, in what organisers called a protest underlining the futility of barriers to resolve conflict. The "Wall on Wall" project by German photographer Kai Wiedenhoefer features 36 panoramas taken in Northern Ireland, Iraq, Cyprus, the West Bank, Morocco, North and South Korea and the border zone between the United States and Mexico. The colour prints have been glued along 364 metres (yards) of the Berlin Wall, which divided the German city for 28 years until it was toppled in a bloodless revolution in 1989. "Walls are no solution for today's major political problems and I think the Berlin Wall is the best proof of that," he told reporters. Wiedenhoefer, 47, captured the images on more than 20 trips between 2003 and 2012 and said he fought with Berlin authorities for five years until winning permission for the open-air display. The venue is the flip side of the so-called East Side Gallery, a mural-covered expanse of the Wall that draws hordes of tourists eager to get a sense of what the divided city looked like. It recently drew conflict between property developers and protesters. Wiedenhoefer, who crowdfunded the project in part online, has won several international prizes for his work in the Middle East and closely followed the construction of Israel's West Bank security fence. However his comparisons to the Berlin Wall, which made East Germans prisoners of their own country, has drawn criticism in Israel, which views the concrete barrier as crucial to stop militant attacks. "It's always a problem -- in November I hung a portrait of the US wall in Mexico here and an American came by and shouted at me, 'You can't compare this.' But for me, it doesn't matter if it's a religious, national or economic conflict -- the idea that you have a problem and you can solve it by building a wall has simply been obsolete since 1989." Wiedenhoefer said the bleak, often heavily militarised ramparts against illegal immigration, like the US fence on the Mexican border and around the Spanish enclaves of Ceuta and Melilla in Morocco, or along religious lines such as in Baghdad and Belfast, were tragic testaments. "The fall of the Berlin Wall was the best political event in my lifetime and we thought at the time, 'That is over, we have a free world without walls', but what you see here are walls that went up after 1989," he said. "There was a real renaissance of walls in that time, which I find very frustrating. It would be wonderful if the fall of the Berlin Wall, which was peaceful, could serve as a model for the other walls." Curator Adrienne Goehler said the barrier built by the US military in Baghdad to keep Shiite and Sunni factions apart was "probably the least-known of these walls", pointing to an image of an abaya-clad woman peeking through a fallen slab in Sadr City. Organisers say they expect more than 200,000 people to see the exhibition before it is dismantled on September 13. Concrete barricades have also been used throughout Cairo since the former-ruling Supreme Council of the Armed Forces took the initiative in 2011 to separate security forces from anti-government protesters. The erection of walls continued in the city during President Morsi's rule, especially in the aftermath of protests at the United States Embassy in 2012. Walls still exist in Cairo, shaping the landscape of its protest dominated downtown. 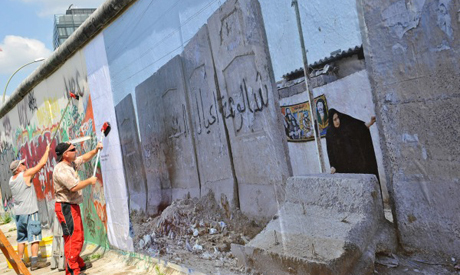 Although Cairo's concrete barricades were not included in this particular exhibition, walls have nonetheless been the subject of various local artists and the walls themselves have been used as venues for revolutionary art.